Hello! Find out more about Stellarium in this tutorial that introduces several of the cool and clever things this astronomy software can do. An image of the winter sky showing the Full Moon near the constellations Orion, Taurus, the Big Dog (with the bright star Sirius), and the Little Dog (with the bright star Procyon). Stellarium – a glorious gift to Humanity in software form – gives you super powers. And best of all … It’s FREE! Always wanted to know the names of the stars and constellations? You can search, play, pan and zoom, examine, compare and anchor your knowledge. It’s a cloudy night? No problem. You can see through the clouds! Wished that the sky had labels on everything? Stellarium has 10 different label types. Stop time? Move time by day, by week? Do you want to see what will happen in 2 months? Or look at the sky during the Pharoah’s reign? You can time travel. You can easily drag and zoom, stop time, go in reverse, make a timelapse, follow the moon through its phases. You have a tool to help you understand the ecliptic and sidereal time and retrograde motion. You can see the great orbital swing of Venus as it circles the Sun. Ok! I’m convinced by your Stellarium review. What should I do now? What’s my call to action? Get a copy of Stellarium. 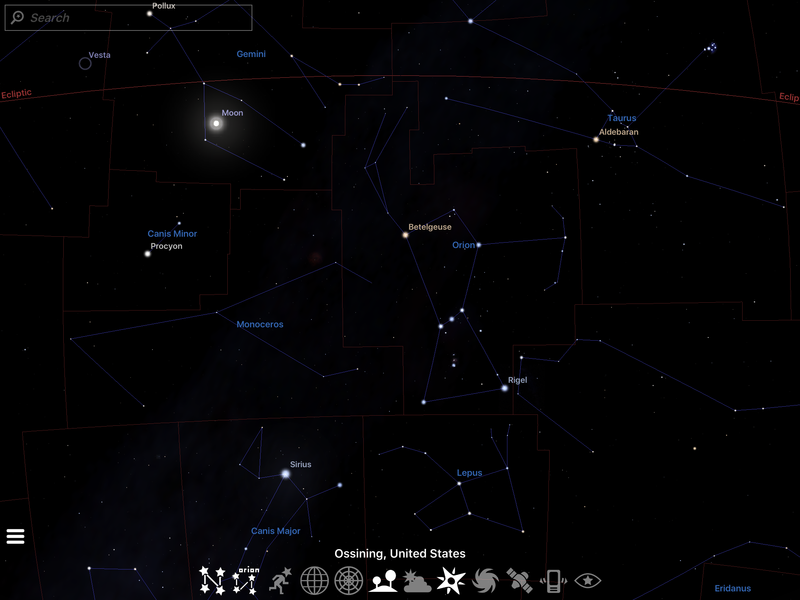 Stellarium is a free, easy to use, and powerful tool – and best of all (did I mention this already?) it’s FREE and easy to use. I will write some specific tutorials about my favorite parts of Stellarium in 2017, but for now… go get it and play! You will be able to see things about sky objects and movements that are impossible to see live. But, once you have seen them with the help of Stellarium, the sky will open up for you – like a gift.